1764-1824. Born at Admiralty House, Whitehall, London, on Christmas Eve 1764, he was the second son of John Buller, the M.P. for East Looe, who was a serving member of the board of Admiralty and a lord of the Treasury in the early 1780’s. His mother was Mary, the daughter of the politician Sir John St. John Aubyn. 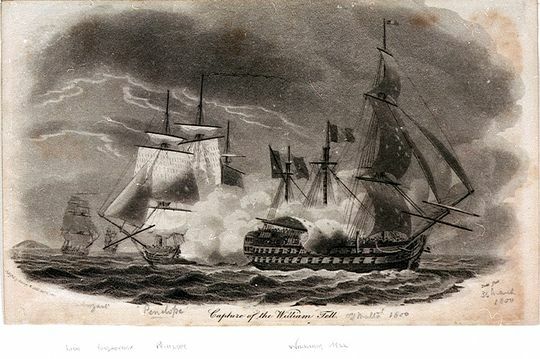 After an education at Westminster from 1774 Buller entered the service in 1777 and served aboard the Courageux 74, Captain Lord Mulgrave, at the Battle of Ushant as a midshipman on 27 July 1778. At the beginning of 1782 he was commissioned lieutenant and appointed to the Sceptre 64, Captain David Graves, in which he went out to the East Indies and fought at the Battle of Trincomale on 3 September, receiving a wound in the action. Following a further promotion to commander on 26 April 1783 he commissioned the captured French brig Chasseur as the Chaser 18 in the East Indies and commanded her at the Battle of Cuddalore on 20 June. During the Coromandel Hurricane in November the Chaser was given up for lost, but by entering the Mannar Gulf between India and Ceylon she was able to ride out the storm in safety. He then brought her home to England, despite concerns as to her sea-worthiness, and she was paid off at Deptford in July 1784. Buller next commissioned the Brisk 16 in May 1785, sailing for Nova Scotia that summer before coming home in the following March with important advices from the commander-in-chief, Commodore Herbert Sawyer. Returning to Nova Scotia shortly afterwards, he was a member of the court-martial in May 1788 which erroneously passed a sentence of dismissal from his ship upon Captain Isaac Coffin for keeping false musters, when the correct punishment should have been dismissal from the navy. Buller was posted captain of the Dido 28 at Halifax on 19 July 1790 in succession to Captain Charles Sandys who had succumbed to a notorious drinking problem, but in August it was reported that he had brought the Brisk into Portsmouth from Halifax after a three week passage. In August 1792 Buller recommissioned the Porcupine 24, serving in the Channel, and following the start of the French Revolutionary War his command was sent to Ireland to transport recruits from Waterford to Chatham. Shortly afterwards Buller joined the Adventure 44 which served as a troop ship going out to Quebec and Halifax. Departing Newfoundland he was fortunate not to be captured by a French force which had been sent out to bring home the grain convoy, the pursuit of which by Admiral Lord Howe resulted in the Battle of the Glorious First of June in 1794, After putting into Cadiz and Cork the Adventure arrived home in early 1795. He was next appointed to the command of the Crescent 36 in March 1795 in succession to Captain Sir James Saumarez, taking the East India trade out to the Cape in company with the Sceptre 64, Captain William Essington. Whilst in passage they fell in with a Spanish sail of the line and two frigates conveying treasure from Havana, but being ignorant of the state of hostilities between the two countries, which the Spanish vessels were not, they peacefully pursued their course. The Crescent was present at the capture of the Dutch ships in Saldanha Bay on 17 August 1796, having been sent in ahead of the fleet by Vice-Admiral Sir George Keith Elphinstone to reconnoitre the enemy anchorage, but Buller left the vessel shortly afterwards, returning home for personal reasons in January 1797 in command of the America 64 with the broad pennant of Commodore John Blankett. During the next two years he commanded the South Devon Sea Fencibles at Dartmouth, but efforts to gain command of the brand new Renown 74 via his brother’s influence with William Pitt failed, with that particular ship going to Captain Albemarle Bertie. In the late autumn of 1799 Buller was appointed to the impressive Edgar 74 in the Channel, which ship twice had to return to Plymouth for repairs, the second occasion being towards the end of February 1800. He exchanged with Captain George Murray of the Achille 74 on 1 March 1801 in order for the latter officer to take the shallower drafted Edgar north to the Baltic where she fought at the Battle of Copenhagen on 2 April. By July Buller was bringing the Achille into Plymouth for a refit before returning to Rochefort, and in November she sailed to join Vice-Admiral Sir Andrew Mitchell’s squadron at Bantry Bay, Ireland, in order to rendezvous for an expedition to the West Indies, in the event of which Captain James Wallis was appointed to act for Buller. With the expedition being cancelled Buller rejoined his command in the following January, during which month three mutineers from the Téméraire 98 were hanged aboard the Achille at Portsmouth. On 29 April the Achille was paid off, and although she was briefly commissioned again under Buller’s command it was only for her to be docked once and for all in June. During the brief peace of 1802-3 Buller remained unemployed, but he was elected to parliament as the M.P for East Looe in succession to his younger half-brother, Frederick William Buller, the other seat in the constituency being held by their elder brother, John Buller. After the resumption of hostilities Buller was appointed to the Malta 80 in March 1803 and in the following month sailed to join the Channel fleet. The Malta transferred to the Ferrol blockade in the late summer and remained there for over thirty weeks before returning to Plymouth for a well-needed refit in June 1804. She then sailed to join the Channel fleet off Brest, and during the early months of 1805 Captain William Granger acted for Buller whilst he was in London on parliamentary business. 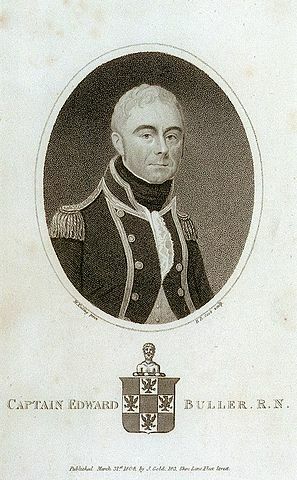 Upon returning to command the Malta off Ferrol under the orders of Vice-Admiral Sir Robert Calder, Buller fought at the Battle of Finisterre on 22 July 1805, earning praise for his ship’s performance where she was one of the more badly damaged, suffering casualties of five men killed and forty wounded in receiving the surrender of the San Rafael and taking possession of the Firme. As a reward for his efforts Buller was appointed a colonel of marines. For many years Buller commanded the Malta, depicted here at her capture from the French when she was known as the Guillaume Tell. The Malta sailed from Plymouth in September 1805 to rejoin the Channel fleet and in January 1806 Buller again attended parliament whilst Captain Nash acted for him. He remained in blockade of Cadiz during the following year and was present at the capture of the French frigate Presidente 40 by Rear-Admiral Sir Thomas Louis’ squadron on 27 September 1806, with Louis temporarily flying his flag on the Malta. The Malta then returned to Plymouth from Lisbon in October before going around to Spithead for a refit. In January 1807 the Malta sailed for the Mediterranean where Buller commanded the inshore squadron, but in helping rescue the crew of the wrecked Portuguese frigate San Juan Principe on the Spanish coast in sight of Gibraltar he succumbed to a fever as a result of the time he spent in soaking wet clothes in the surf, having twice been almost swept away. He thus resigned his command to recover and was succeeded by Captain William Shield. Buller was promoted rear-admiral on 28 April 1808, and later in the year, on 3 October was created a baronet. From December 1809 he was second-in-command at Plymouth with his flag at various times aboard the Resolue 36, Lieutenant John Toup Nicholas, and the Prince Frederick 64, Commander William Fisher and Commander Thomas Grove. Occasionally he assumed the chief command in the absence of his superior, Admiral Sir Robert Calder, whilst during the spring of 1812 it was rumoured that he might join the Board of Admiralty, although in the event this did not happen. He was promoted admiral on 12 August 1812, from which point he saw no further active service, although again it was rumoured that he had been considered for the position of commander-in-chief at Plymouth in 1820. He died at his seat of Trenant Park, Cornwall, on 15 April 1824, and with no heir his baronetcy became extinct. Buller married Gertrude Van Cortlandt, daughter of a colonel, in Nova Scotia on 15 March 1789, having one son who died at a young age, and one daughter who married into the Elphinstone family. A short-tempered man, he was a very poor seaman but at least had the sense to realise it. He was Tory M.P. for East Looe from 1802 -20, supporting the government initially but then losing interest through his failure to secure employment. Before then he had been a Pittite. He inherited Trenant Park from his brother, John Buller, who bought it for £15,000 in 1806 but died a year later.